We have attended the February 2016 edition to see and acquire the latest tendencies and materials that we will use in the designs for our Spring / Summer 2017 collections. 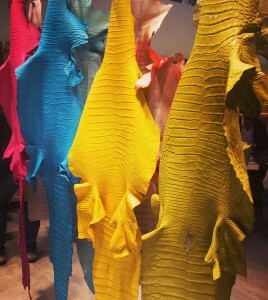 The picture shows authentic crocodile leather that was exhibited in Lineapelle and that we have acquired. Crocodile leather is greatly appreciated because, aside from being a natural material, every piece of leather is different; therefore, every item is totally exclusive and different from the others. Durability is another characteristic, which allows us to make belts of an excellent quality and long lasting. At LEYVA, we use the best materials for our belts and accessories and in our Exotic Collection we use crocodile leather among many other pelts and skins. If, to the great quality of the crocodile leather we add the fact that we handcraft our belts, with the maximum care for details and with a spectacular design, the end result is belts that are true luxury items.